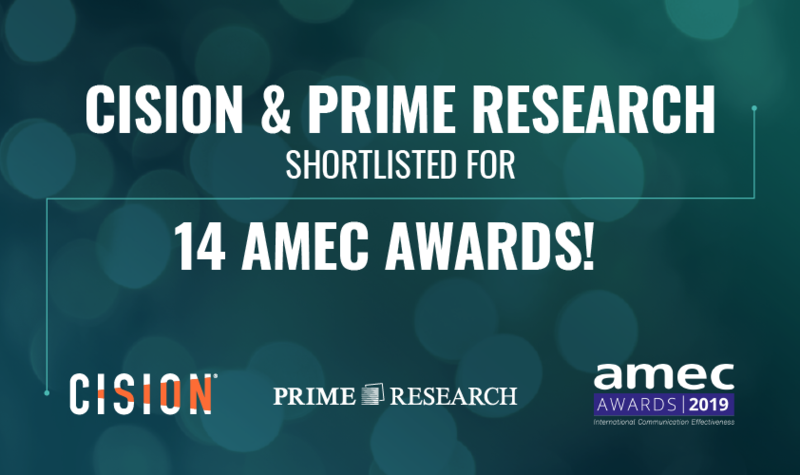 Cision has secured the highest number of nominations at this year’s AMEC Awards, with the company featuring in 14 shortlisted campaigns. The company, including its PRIME Research division, has been nominated for 12 awards, while its insights work has also been name-checked on a further two award nominations. The Earned Media Management software provider is up for two awards in the Best use of measurement for a single event category; with its revolutionary communications congress – CommsCon – shortlisted for the award, as well as PRIME Research’s work with Kia. Cision’s work for Slimming World’s Carbfusion campaign has been selected for the Best measurement of consumer communications, Best use of integrated communication measurement/research and Best use of a measurement framework categories. Its analysis programme with CNBC International was shortlisted for the Best multi-market reporting, ‘Step change award’ for the best improvement of a measurement journey and the Innovation award for new measurement methodologies. Cision Portugal has been selected for the Best measurement in the public and not-for-profit sectors for its work with Visit Portugal and Cision France is nominated in the Best multi-market reporting category for its work measuring cross-market corporate issues in the beverage sector. As well as the nomination in Best use of measurement for a single event, PRIME Research’s work with Kia on its Time to go Mobile? campaign is shortlisted for the Most impactful client recommendations arising from a measurement study and Plain language award for simplicity in campaign effectiveness measurement and reporting prizes. Cision’s research also features in Red Consultancy’s submission for its Rubbish Cafe campaign for Ecover, which is shortlisted for the Most effective planning, research and evaluation of consumer communications and the Best use of measurement for a single event awards. The winners will be announced at the official AMEC Awards ceremony, which will be held on the last night of the organisation’s summit in Prague next month. The full list of nominees can be found here.